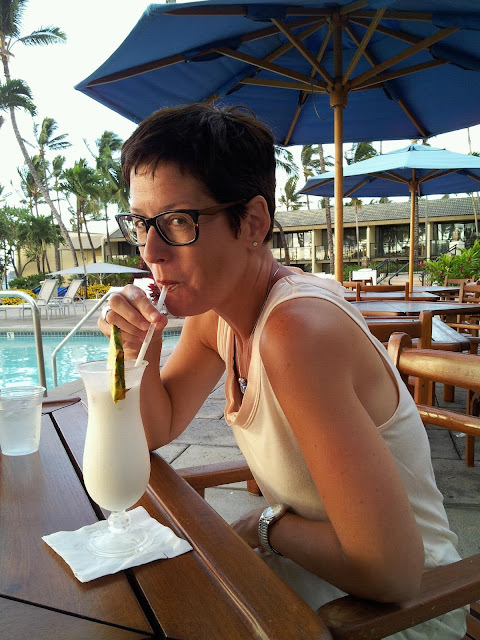 The Adventures of Scott & Caroline: Happy Anniversary To Us - Let's Go To Maui! 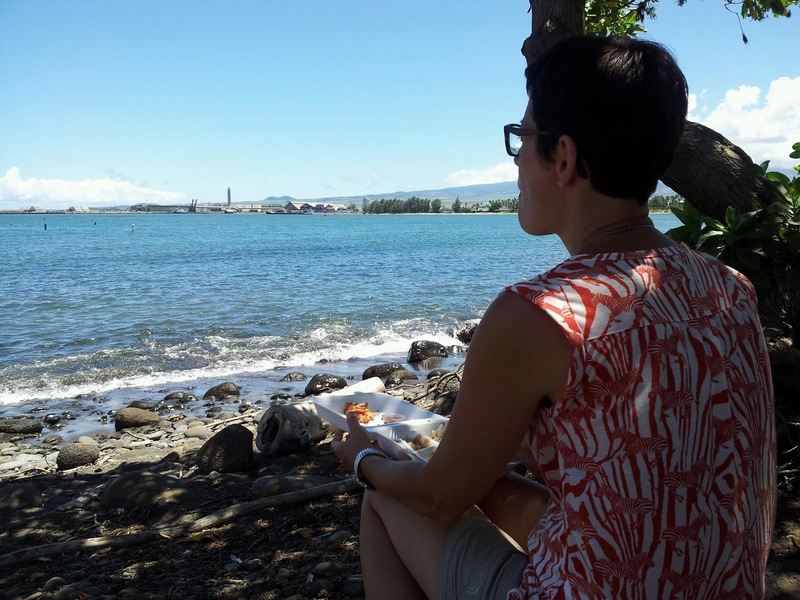 Beautiful scenery, warm weather, tropical drinks, copious amounts of slow cooked pork products... Is there a more romantic destination than Hawaii? 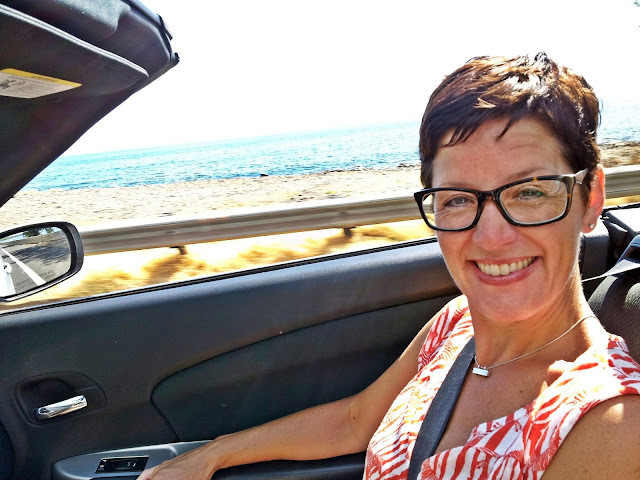 Just under five hours by nonstop flight from the Bay Area, Hawaii is an extremely popular destination for Californians, and one that we had never visited in our 15 years as Western Americans. It almost seemed too close, too easy, and therefore easy to put off for "some other time". But close and easy being prerequisites for our 15th anniversary celebration, we decided it was finally time. As a bonus, it allowed Caroline to check off one of the few remaining American states she'd not yet visited. 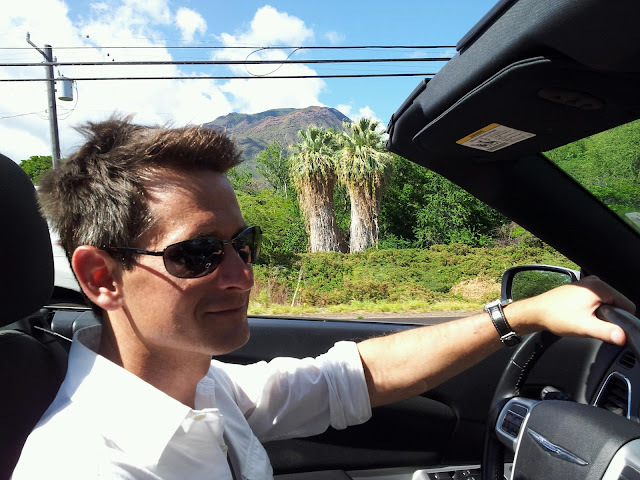 Scott went to Maui with his friend John's family close to 30 years ago, at which time he thought to himself, "why would someone live in Michigan when it's possible to live here?". Even then, he knew he wasn't going to last in the Midwest much longer. So, it was time to decide on island. 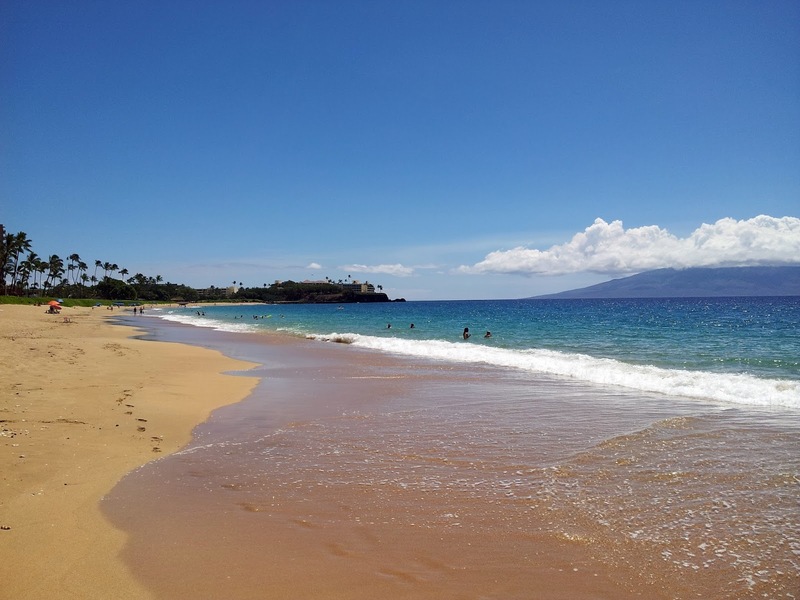 A bit of research and many conversations with friends and family later, we narrowed it down to Maui and Kauai - Kauai for the dramatic scenery and outdoor activity possibilities, and Maui for the laid back Hawaiian vibe, and a few days of relaxed island living. This being our 15th anniversary, we went for laid back and promised ourselves we'd come back to Kauai with backpacks and hiking shoes for a completely different style of travel. Island settled, tickets booked, time to go! Hawaiian Airlines did their best job to really make being in Hawaii seem extra fantastic by making their flight as uncomfortable as possible; the highlight being the complimentary mai tai before landing at 10:30 in the morning. Just an hour after we'd landed, we 'already' had our bags and were ready to go pick up our rental convertible for our stay. First stop? Food truck plate lunch! 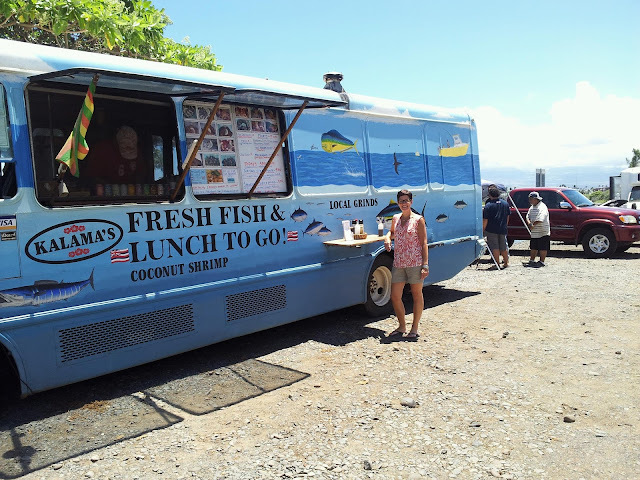 Lunch was at a very locals-like food truck gathering for some coconut shrimp and chicken katsu, finding an ocean-front palm tree trunk to sit on in the balmy sea air. This Maui destination is looking pretty good so far. 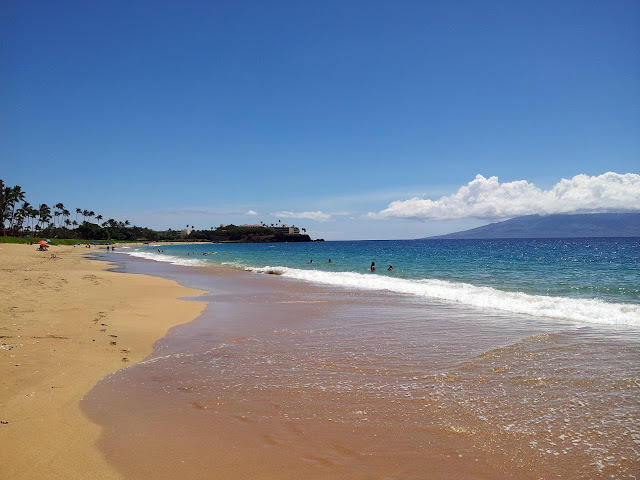 After lunch and a quick stroll on north Ka'anapali Beach (wow! ), it was time to head to our accommodations for the next five nights, the Wailea Beach Marriott Resort & Spa (wow! ), which we chose for its more modern style and intimate feel (oh, and the amazing infinity pool). The rest of day one was made up of beautiful scenery, warm weather, tropical drinks, and slow cooked pork products... Feeling very successful so far. Ahh, to be middle aged and in love! Scott surprised Caroline at the rental car office with a convertible!